Photo: by Takekaju) Delicious Persimmon slices. Persimmon trees classified broadly into two general categories: those that bear "astringent fruit" (while unripe) and those that bear "non-astringent" fruits. An astringent cultivar, which is commonly cultivated in Japan known as “Hachiya,” is high in tannins and must be allowed to ripen completely on the tree itself until it attains jelly-soft consistency before accepted to be fit for consumption. 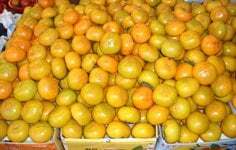 A non-astringent persimmon, on the other hand, contains less tannin and can be eaten while it is crispy, as in apples. Astringency can be removed by treating the fruit with carbon dioxide or alcohol. Non-astringent varieties: Fuyu (Fuyugaki), Gosho/Giant Fuyu/O'Gosho, Imoto, Izu, Jiro, Maekawajiro, Okugosho, Suruga, etc. Persimmons in a Seoul (South Korea) market. In the stores, select fresh fruits featuring bright yellow-orange color without any surface bruises or cuts on them. "Dried persimmons" can also be available readily in the supermarkets and feature many similarities to dried apricots. Dried fruits can be enjoyed as snacks or used in desserts. They widely employed to make traditional Korean spicy recipe, sujeonggwa, while a matured, fermented fruit is used to make persimmon vinegar called "gamsikcho"
Ripe persimmon fruits are safe for human consumption, including in the pregnant women. Allergic reactions to the fruit are very rare. (Medical disclaimer). <<-Back to Fruits from Persimmon fruit nutrition. Visit here for an impressive list of all variety of fruits with complete illustrations of their nutrition facts and health benefits. Agri life extension-Texas fruit and nut production.